The fact that we’ve been able to replicate the desktop experience of TT in a form factor for the phone that is robust enough to appeal to the professional trader is a big achievement. TT Mobile comes complete with MD Trader®, access to the full audit trail and order book, charting, spread trading and more, allowing you to take the markets with you virtually anywhere you go. Many moons ago, I had a clip-on quote machine that attached to my belt. I could see nothing more than indicative inside markets on major FX pairs, but it was there with me, always. Now with TT, I can take out my phone and open MD Trader to route orders around the world with only a few clicks. I can scroll through days of audit trail data while riding the train home. And I can pull up charts on all of the major markets. It’s empowering. As a former full-time trader who still dabbles in trading, having the ability to pull out my phone to check the markets, monitor positions and trade, regardless of where I am—on the train, at a ballgame, in bed watching the late news—is incredible. Ever been forced to close out a position because you’re leaving your desk for lunch, dinner, a meeting or a kid’s soccer practice? Not anymore. Your orders and positions travel with you from our browser or desktop solution. I’m obviously very excited about how we’re empowering mobility with our new phone apps. But don’t take my word for it. See for yourself. TT Mobile is available for both Android and iOS phones, and you can download them today from Google Play and the Apple App Store. Tell me what you think by tweeting to me at @patrickrooney. I look forward to your feedback. TT Mobile for Android is available from Google Play. 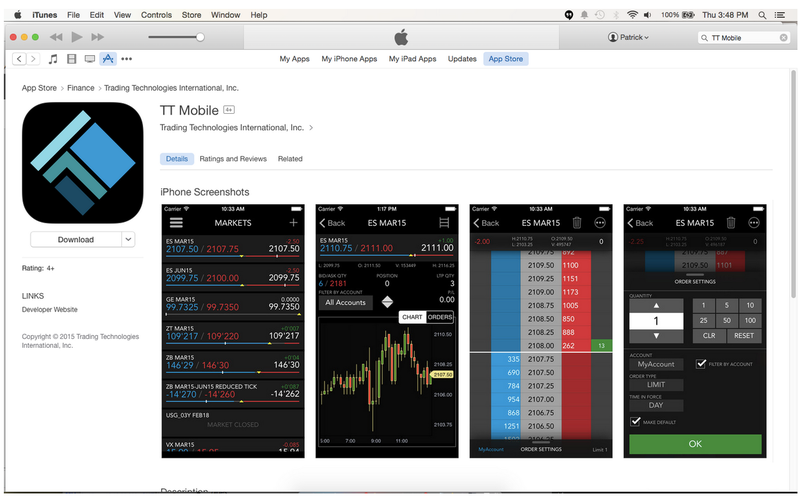 TT Mobile for iOS is available from the Apple App Store.